On this, the last day of January, I added the final item to my monthly list of "nice things and accomplishments" that I keep in my little life notebook. Usually I average about 10-12 nice things and accomplishments for each month, 6 or 7 on a skimpy month, as many as 13 or 14 on a lush month. For this past month I had 20. Twenty! A record! They ranged from submitting the abstract for my paper on The Secret Garden for the centennial Secret Garden volume to having the abstract accepted, from revising my chapter book and submitting it a possible agent to having the agent accept it, three courses at CU successfully launched, fun in Texas with Gregory, my magical days at the poetry retreat. The best month ever! But it was also one of the worst months ever: my mother's terrible fall and injuries, the devastation in Haiti. Both of those are so much more hideous than my 20 little nice things are wonderful. They seem to cancel out all my nice things. I would trade all my 20 nice things in a heartbeat to have prevented my mother's fall. It almost seems frivolous to tally "ALA Notable for Oliver" and "delightful and productive meeting with all five of my SCBWI mentees" in a month that has so much pain and heartache in it for my family and for the world. Except that we can't think that way. We just can't. It doesn't make the terrible things any less terrible to allow them to obliterate all the little lovely things. In dark times, we need our patches of sunlight more, not less, and to honor and celebrate them. Yes, I would trade all my little nice things right now for my mother's good health, but the fact is that I'm not being offered the chance to make that trade. Refusing to celebrate the nice things won't do ANYTHING to help my mother recover or, for that matter, to help the victims of the earthquake in Haiti. Yes, the terrible things are terrible, but the nice things are still nice. The terrible things in their terribleness exceed the nice things in their niceness, but they don't erase their niceness. The nice things are still nice. I actually had about six reasons for being crabby yesterday, only one of which I chose to blog about. But now today everything is better. My very very bad thing to be sad about yesterday is that while Gregory and I were down in Austin last weekend, my mother fell and fractured her left hip and left shoulder, this two years after a fall in which she fractured her right hip. It was terrible to be so far away when it happened, and she faces a long and uncertain process of rehabilitation. Neither of us knows what the future will bring. But of course nobody knows what the future will bring. That is probably the only thing we DO know: that this we DON'T know. 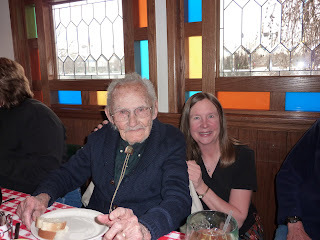 But yesterday she moved from the hospital to a care center for physical therapy as she recovers, and best, my beloved sister and her husband are coming out to visit soon. So I feel cautiously hopeful. I was also sad yesterday that Gregory woke up sick on the long-awaited day on which he was to head down to Colorado Springs to play tenor sax in All-State Jazz Band. Oh, no!! But he slept through the morning, then returned to school in the afternoon, and now he's down in the Springs beginning two days of intensive rehearsals for the concert on Saturday. The lovely teacher at the lovely school with the lovely upcoming young authors' event emailed me about the unlovely forms I have to fill out and told me not to stress about them, just to do my best. Okay. I can do my best! I finally faced the extremely dull and dreary letters I had to write as chair of the Dean's Review Committee for Tenure and Promotion for the University Libraries. If only I had done them sooner! But at least they're done now. And it snowed last night, just a couple of inches, if that, but oh so pretty outside my window. Christopher's girlfriend, Samantha, came over with flowers for my mother, as well as one single white rose just for me, because, she said, "You deserve it." I don't know if I deserve having such a sweet and caring young woman in my life, but I do love it. So today, everything is better. Not perfect. It never is. But better. I try not to blog when I'm crabby, because I want my blog to be inspirational and encouraging; I think the world has sufficient crabbiness in it already, and not enough hope and cheer. But I'm crabby today. And I want to blog today, anyway. So I'm going to try to draw some positive lessons from my crabbiness to forestall future crabbiness. I am crabby because I am supposed to speak next week at what was to be (and I'm sure will be) a delightful young authors' night at a school in Jefferson County. The event involves proud children sharing their work, and then a visiting author (me) giving a talk to the children and their parents. I agreed to be the visiting author and charged the school $150 for my time. It is about an hour's drive each way, after a long full day of work already, and however rewarding the evening will be, I am still unwilling simply to work for free, any more than the teachers who teach these children are willing to teach for free. Just because something is worth doing, and you love doing it, doesn't mean that you should be expected to do it without any financial compensation. I could tell that the school thought I was a pretty terrific bargain. So why am I crabby? I am crabby because in order to be paid this small stipend, I have to fill out a whole host of notorized forms to report that I have no criminal record, to waive my right to worker's compensation if I'm injured on the job, to pledge that I will pay my income tax on this money. I can hardly even figure out the various things I'm supposed to check on the forms. The sentences on the forms aren't even grammatical English sentences. The one about my criminal past wants me to sign my name to this statement: "Vendor nor those working for the vendor have been convicted of a felony or other serious offense." Don't they mean "Neither vendor nor those working for the vendor"? Otherwise, isn't it saying that I HAVE been convicted of a felony or other serious offense? And it hardly seems worth $150 to go find myself a notary to witness my waiver of any claim to worker's comp for giving my little talk that evening. It just doesn't feel fun any more, filling out all these tedious and confusing and exasperating forms. I'm leaning toward just telling them that I'll go for free, as a form of community service. But then that seems like rewarding Jefferson County for having such terrible forms to fill out. Now, I said I was going to try to draw some lessons from my crabbiness to forestall future crabbiness. I think maybe the lesson is that I should have charged more for my time. Other writers charge more for their time. I think I'm really crabby because I undervalued my time in the first place, and now I feel bitter that even to get this very small stipend I'm forced to jump through so many hoops. If I had valued my time more, and charged a more appropriate honorarium, then I wouldn't mind jumping through some hoops to get it. Though I think I would still mind signing my name to that ungrammatical sentence! I spent the weekend in Austin with Gregory, who was auditioning on jazz saxophone for the Butler School of music at the University of Texas. We spent Saturday morning at the music school; as Gregory was warming up in one of the hundreds of practice rooms, I could hear the intermingled sounds of violin, voice, trumpet, piano, percussion, played by young people who had come from all over the state of Texas, and from all over the country, to pursue their dream of making music. The lunchtime orientation program featured eight young harpists, performing an original composition for harp written by one of their members. The very air vibrated with creativity and joy. Then we spent Saturday afternoon with a friend of mine from high school, Phillip Wade, whom I hadn't seen for at least thirty years. He started painting back in high school; I reminded him of how he used to sit in class sketching the back of the neck of the boy in front of him. He painted a wonderful oil portrait of me, titled "Yvonne of Brittany," in which I'm posed wearing a purple dress from his mother's attic and pretending to pick pears from his family's backyard pear tree. It still hangs on the wall in my home office, above the desk where I'm typing this. After earning a degree in English literature, Phillip went to art school in Philadelphia, and is now a successful painter in Austin. I regularly receive announcements of openings for his art shows at various local galleries. That's one of his pictures, "Rabbit in a Hat," above. It was wonderful seeing Phillip. I love everything about his life. He lives in a small Victorian bungalow with his studio tucked behind it; he drives an ancient red Honda with peeling finish; he spends all day painting whatever he wants to paint, with breaks for bicyling along the banks of the Colorado River, or wandering through town in search of material, or teaching a painting class, or dining with artist friends. His work makes no concessions to fads or fashions; he paints in a realistic style, but usually with whimsy and humor as well. Go to his website and buy something! So my Saturday had music all morning, and art all afternoon, dreams for Gregory's future in the morning, memories of my past in the afternoon. I call that a good day. I take thyroid medication, and after my checkup and blood work earlier this week, my (wonderful) doctor called me and told me that my thyroid levels are still too low. She suggested a higher dose of the medication, but I thought that first I should try taking it exactly as prescribed: every single day (not just when I happen to remember) and on an empty stomach: either one hour before or two hours after eating. The only problem with this plan is that, if this is what an empty stomach is, I've never had one. Ever. I don't have one during the day because I snack all day. I don't have one in the evening because I snack all evening. And I don't even have one first thing in the morning because I wake up every single day to my beloved writing beverage, Swiss Miss Hot Chocolate. I asked Dr. Hrywnak if taking my medication with Swiss Miss Hot Chocolate could count as taking it on an empty stomach. She said no. Tea, yes. But milky, creamy, nice, thick, foamy hot chocolate, no. So now I've been up for half an hour, with no hot chocolate. I gulped down my pill as soon as I woke up, with water, but I still have to wait another half an hour for my hot chocolate. Part of me - most of me - wants to go back to bed and lie there under the covers until it's time for Swiss Miss. I certainly don't feel like getting out my clipboard, pad of paper, and trusty Pilot Razor Point fine-tipped black marker pen to start writing. I may have to force myself to stop eating after supper and take the medication before bedtime, which would also have slimming results, I'm sure. The trick there will be remembering to take it, when I'm often so tired I can barely remember to take off my clothes and put on my nightgown, and often forget (or can't be bothered) to floss my teeth. But this early morning vigil of waiting for my Swiss Miss is going to undermine the hour-a-day-first-thing-in-the-morning writing philosophy on which I've based my entire life as a writer. Oh, I think HALF an hour is long enough to have a stomach SO empty. Don't you? Last night a dear writer friend and I drove down to Denver to attend an agent panel sponsored by SCBWI, during which two top-notch locally based agents, Kristin Nelson and Kate Shafer Testerman, read first pages submitted by the attendees, responding to them exactly as they would in their day-to-day work as agents: that is, stopping exactly at that point at which they had lost interest, at which they were no longer compelled to read on. The event was held at the darling historic Smiley Branch of the Denver Public Library (an original Carnegie library dating from 1918), but it was not a smiley event. It was mesmerizing - and terrifying. Both agents reminded everyone at the outset of the evening that although they do not consider themselves at all to be brutal people, this kind of session can be "really brutal." Last year, Kate read 3,800 queries, from which she requested 74 full manuscripts, and signed two clients. Kristin, with a similar volume of submissions, signed one. I didn't want to have my first pages read. And as I had just had an agent agree to represent me this very week, I didn't feel that I HAD to. But in solidarity to my friend, I did. I was the very first to go down to dismissal - thank goodness the readings were anonymous! "I'm on notice," one of the agents said after a few lines, meaning, "on notice to stop reading." "I'm starting to waffle." They did let the reading go to the full two pages, which was either a triumph for me, or because they weren't yet warmed up for the evening. But they both said they wouldn't have read on from that point : "I'd stop here. I'm not interested in the scene. There's nothing wrong with the writing, but there's nothing overwhelming or compelling." Ouch! At least, they said, the writer hadn't committed the cardinal sin of starting with a character waking up a dream (my character was startled out of surreptitious in-class reading). The next author to be read, poor thing, began with a character waking up from a dream. Double ouch! 4. Unbelievable details in the writing: "Darkness crept out of the open doorway." How can darkness creep out of a doorway? 16. Sounding too much like "This will be educational for children!" 17. Cliched opening: "If only I hadn't done x, everything would be different." I stopped taking notes after that! I have to say that I agreed with the agents on every point, just about, except that I do think they dismissed a couple of the manuscripts too quickly (including mine, of course! ), as not suitable for middle-grade readers, when the manuscripts were clearly intended to be chapter books for younger readers (though this is perfectly appropriate for them to do as agents - they both do represent work only on the older end of the children's spectrum; they had explicitly said ahead of time that they don't do picture books, but hadn't said ahead of time, "or chapter books, either.") I don't think my first two pages that I shared, the first draft of a book I started writing this week, were all that compelling and sparkling. Whenever I attend one of our philosophy department hiring meetings, I always come away thinking, "How did they ever hire ME?" I came away from yesterday's panel thinking that it is VERY VERY VERY hard to produce writing good enough in the first paragraph or two to take away the breath of savvy agents who read thousands of mansucripts a year. How did anyone ever publish ME? But - somebody did. And somebody - lots of somebodies - published my dear writer friend, too, even though the two agents made similarly short work of her opening page. At the end of the evening, part of me wanted to go home and write better books; part of me wanted to go up to Kate and Kristin (who were really as kind as they could be through their absolute, uncompromising honesty) and say : "Just to let you know, I found out today that my most recent book, How Oliver Olson Changed the World, was named as an ALA Notable Children's Book of the year." And it was! As this happened more than a week out from the fairy dust, I'm not attributing this one to the fairies. I'm attributing this one to me. So you may remember that when I had the fairy dust sprinkled on me at Alice's Teacup, I had a double sprinkle: one general sprinkle on me, and one more targeted sprinkle on my new chapter book manuscript. The very day before the sprinkling (just as I was leaving to go to the airport for the poetry retreat), I had sent the manuscript off to an agent. Last Thursday, a week to the day after the fairy dust sprinkling, the agent emailed me to say that he loved the book and was willing to represent me. I don't want to give details about the agent yet, because I haven't yet received or signed his contract, so it isn't a DONE done deal. But oh, he seems so wonderful; he represents a dear friend of mine, and she said he is indeed wonderful, the best agent she has ever had (and she's had quite a few). After thirty years of working all alone in this business, I think I'm going to have an agent. This is a huge step for me. Now, I think there is a time limit on the fairy dust. If some good thing happens to me a decade from now, I'm not going to say, "Oh, remember that fairy dust from Alice's Teacup? January 2010?" But if some good thing happens within a WEEK, well, then fairy dust is clearly implicated. Like much of the children's book world, in 45 minutes I'll be listening to the announcement, from ALA in Boston, of this year's Newbery Medal announcement, as well as the Caldecott, Printz, Coretta Scott King, and other major children's literature awards. This year I followed the buzz around the Newbery more than in past years, reading the posts on Jonathan Hunt's Heavy Medal blog and paying attention to the results of various Mock-Newbery polls around the country. And although my name has never been mentioned as a serious contender, ever, it was tantalizing to read Hunt's catalog of how many starred reviews each Newbery Medal and Newbery Honor book had received over the past decade, and to learn that in 2007 two of the Newbery Honor books had received NO STARRED REVIEWS AT ALL. That means that any unrecognized and uncelebrated author can hope. And heck, How Oliver Olson Changed the World received one starred review, and was on the Bulletin's Blue Ribbon list, and was named one of the 100 best titles of the year by the New York Public Library, and is a finalist for a Cybil award. But, unsurprisingly, it didn't win the Newbery. They would have called me by now to tell me. For the thirtieth year in a row, since I've been writing and publishing children's books, I didn't get The Call. So I went to my trusty little notebook where I write down all my good advice to myself and made some notes. My writer friend Cheri Earl has concluded from all the Newbery buzz that she will never allow herself to be influenced in anything she writes by thinking about whether it will win the Newbery. Cheri said, in her post on the terrific Throwing Up Words blog: "The promise of billions or winning a random chance award or even the lure of publication will never influence what I choose to write or why I choose to write." That would be a good thing for me to tell myself, too. But mainly I'm telling myself that I cannot expect my life to change as a result of some one-in-a-million chance, a bolt-out-of-the-blue miracle. If I want my life to change, if I want to make my life be more the way I want it to be, it's going to have to be through taking small positive and constructive steps every day. And the most important of these is simply: write. It's been fun following the Newbery buzz, and I can't wait to hear the announcement - now in thirty minutes! But what will give me the life I want to have is simply the writing itself. So as soon as the announcement is over, I'm going to make myself a cup of Swiss Miss hot chocolate, get out my favorite Pilot Razor Point fine-tipped black marker pen, and a blank pad of paper, and I'm going to write page 1 of my new chapter book. I have all day off today for the MLK holiday. My goal is to have a first five-page chapter to share with my writing group tonight. That is the gold sticker I'm going to give myself. I may not have written the most distinguished book of the year, but I can distinguish today for myself by writing. I said I wasn't going to count down the weeks of the semester, because I don't want to count my life away, but it really is irresistible, especially if I don't say, "Whew, one terrible week is behind me," but insteady say, "Wow, what a pleasant week that was!" And it was a pleasant week. All three classes have lively, engaged students. I loved the familiarity of my dear, darling Intro to Ethic course over in the Farrand dorm, where I knew so well that the students would find Book I of the Nicomachean Ethics hard to read, and then I'd illuminate it for them so helpfully, with such engaging clarity. I liked the challenge of teaching material I had never taught before in Philosophy and Society, having to be on my toes in front of a large lecture hall. And best of all, I loved returning for the third time to Rousseau. We begin with his Confessions, his dazzling autobiography, and yes, the students were dazzled, and I was dazzled once again, too. I also met with three of my mentees for the Society of Children's Book Writers and Illustrators mentoring program, and I do think that I gave my advisees pretty excellent advice on how to strengthen their already promising manuscripts. I told the first to eliminate one unconvincing and distracting plot line and concentrate her energies on her riveting central story line, taking longer in chapter one to motivate the crucial conflict - and to consider trying to develop the kind of voice for her narrator that will make us fall in love with her on the strength of voice alone. I told the second one to take her 150-page-long manuscript and chop it ruthlessly into two different 50-page chapter books and then throw the rest of it away (or save it to appear in bits and pieces in other projects) - to save all of her delightful sparkle, but strip away extraneous story lines and long stretches of dialogue that don't advance the main plot. I told the third to introduce her antagonist earlier in the book and intensify the conflict between protagonist and antagonist, and to streamline a disproportionately long scene in the middle of the book that occupies several chapters in a short mansucript. If only I could give myself such good advice about my own manuscripts, but it's always easier to see the potential for improvement in somebody else's story. I wrote the abstract for my paper, "Rousseau Redux: Romantic Re-visions of Nature and Freedom in Recent Children's Books about Homeschooling," and sent it off an hour ago. This has been hanging over my head for six months at least, so it feels so good to cross it off my to-do list. I had several good walks with my friend Rowan, including a beautiful icy, muddy hike on the South Shanahan trail. I wrote a poem on Thursday and emailed it to my poetry buddy, Clara. I attended an excellent talk by a former grad student and went out to dinner with her and four other philosophy department women. The new semester has begun at CU, and I'm teaching three classes: Intro to Ethics (which I teach all the time, where I know the readings by heart and have every witty comment down pat), Rousseau (which I've taught twice before, but, oh, there is TONS of reading and I will need to re-read all of it in order to teach it well), and Philosophy and Society (which I haven't taught for years, and for which I'm using a new textbook I've never used before). I am going to have to prepare! And I'm not used to preparing. I've fallen into a blissful rut of teaching Intro to Ethics over and over again. One year I taught it five times: twice each semester (both in a large-lecture format with 150-200 students in the class and in a small seminar format over in the Farrand Hall Residential Academic Program), and in Maymester (our three-week intensive May "semester") as well. There was no reason NOT to keep teaching it over and over again: it was easy for me, and the students loved it, and really, I never get tired of talking about Aristotle and Epictetus and my other beloved philosophers from the past. But every once in a while, it's good to do something new. So I'm doing it. This means that I am going to have to start using my time more productively. No longer will I be able to sit at my desk in my office dreamily checking Facebook or Googling to see if I happen to have won any prizes that somebody forgot to tell me about. My down time will have to be "up time" - working up these new readings, making notes, deciding how best to prepare the material. No more will I sit on the Skip counting the cars going by in the opposite direction (I love to count things!). No, I will be sitting on the Skip reading Rousseau! I've resolved NOT to start counting down the weeks of the semester, much as I do love countdowns. I will NOT count my life away! I'm just going to focus on making each day happy and productive. "Be intent on the perfection of the present day" is one of my mantras. This semester I'm actually going to follow it. Each year at the poetry retreat our poet leader for the year gives us an assigned reading for us all to do before we come, so we have a common reference point. This year it was the Pulitzer Prize-winning collection of poems Late Wife by Claudia Emerson. The poems in it are uniformly beautiful: evocative images that focus on divorce, breaking up a home, and then a second marriage, the kind of poems that give you a little shiver up your spine after you finish reading. One of the prompts Kathleen gave us was to select a poem from Late Wife and then write our own poem using both the first line and last line (not first sentence and last sentence, but focusing on the LINE), and then writing our own new lines in between. This was the prompt I most DIDN'T want to do. Claudia Emerson's images seemed so specific to her own experience, and also had such a rural sensibility - I just couldn't imagine grafting my own experience on to them. And it seemed MUCH too hard to use BOTH the first line AND the last line. It just couldn't be done! And I wasn't even going to try! But then I did. Because really, what is the point of going away to a poetry retreat if you aren't going to try to stretch and grow? I chose her poem "Aftermath," that begins with the line "I think it is time now for the second cutting" and ends with the line "with the blunt edge of a practiced tongue." I made mine into a poem about a trial separation leading to an ultimate dissolution of marriage. I'm not going to post it here, because, well, because I don't want to! But I was amazed at how using Claudia Emerson's eloquent opening and closing encouraged me to take more risks with my own language. I think that the group of poems that our group produced from this prompt were my favorite group of poems, taken as a whole, from the retreat. We really do get better as writers when we steep ourselves in the work of amazing exemplars. I'm home from the poetry retreat. The place where it was held was wonderful: St. Marguerite's Retreat House in Mendham, NJ. It's a 100-year-old former orphanage, and we each chose one of the tiny but lovely orphan's rooms to be our own for the weekend. I was on the narrow green hallway; my friend Clara was on the narrow pink hallway. The meeting rooms were comfortable and cozy. The food was homey and delicious: before each meal a nun's assistant would walk the hallways ringing a bell to summon us to the table. The poet who led the retreat was wonderful: Kathleen Driskell. I learned that the only thing that is essential to poetry is the line, and yet the line is seldom discussed. So during the retreat we focused on the line. We learned that poets call the end of the line "the place of honor" - that place where the word chosen carries extra weight. We learned that poets call the left-hand margin "the safe return." The prompts Kathleen gave us were wonderful. I'll give a few of them here over the next few days. For one of them Kathleen asked the sixteen of us to look back at the poems we had written so far during the retreat and choose two favorite words from ours; we then compiled a list of everbody's words, generating a list of 32 absolutely delicious words. Then we each chose one of those words (not one of our own two nominees for the list) and wrote a poem beginning and ending with the word. recorded here upon the map. My writer friend Laurie, who lives near the East Side Alice's Teacup in Manhattan, says that she took one writer friend there to get fairy dust sprinkled on her and the friend sold her first book the next day; Laurie got fairy dust sprinkled on her and sold a book series the next day. So I had high hopes. I met Laurie at the West Side Alice's Teacup at 73rd Street and Columbus, and another writer named Lucy joined us. We each ordered a scone and shared all three: pumpkin, strawberry chocolate, and lemon blueberry (lemon blueberry was the best). Lucy asked Laurie if the fairy dust was a material substance or just imaginary. Laurie made the mistake of saying in a low voice, "It's glitter." I glared at her, and then she quickly corrected herself: "Fairies come in at night and scatter the fairy dust and then the staff sweeps it up and puts it in a little bowl." I had the fairy dust sprinkled on me. Six hours later I checked my email, and How Oliver Olson Changed the World had just had book club rights sold to Scholastic, which hasn't happened to one of my books for ages. Coincidence? I think not. Laurie said that even though she lives so close to Alice's Teacup she is careful not to abuse the fairy dust and have it sprinkled on her too often or too greedily. I think that is a good advice. It's powerful stuff, after all, and needs to be treated with respect and appropriate caution. It can lead to wonderful things, when used just right. I leave Wednesday for a blissful new year's getaway. First I fly to Newark and spend the night with my sister, Cheryl, who now lives in our childhood home on Malcolm Avenue in North Plainfield, NJ. We plan to spend the evening watching her Christmas present DVD of Season 1 of the Patty Duke Show. On Thursday I'll head in to the city with Cheryl when she goes to work in the morning and at 8:30 present myself at the door of my publisher, Farrar, Straus & Giroux, located in the famed Flatiron Building, to go over the galleys for my middle-grade novel scheduled for this coming fall, One Square Inch. Then at 10:30 I'm meeting several other Manhattan-based children's book authors for tea and scones at Alice's Teacup, where they sprinkle you with actual fairy dust. From there, we'll all head to Penn Station to get a train to Morristown, NJ, to a monastery where we will be attending a weekend-long poetry retreat led by acclaimed poet Kathleen Driskell - three days of doing nothing but writing and reading poetry. I'm aquiver with excitement! I can't decide if I should ask to have the fairy dust sprinkled all over me, or have it sprinkled just on one particular manuscript. I'm inclining toward the more targeted sprinkling. And yet, this probably will be my only chance for fairy dust for the foreseeable future, so maybe I should be more lavish with it? Fairy dust everywhere? Or would more concentrated application of fairy dust be more effective? I'll let you know! Today is the first REAL day of the new year. Weekends and holidays don't count. Mondays count! I leapt out of bed this morning and now can say that I have my life completely organized at last: doctors appts made for me and the boys, dentist appts made for me and the boys, library books returned, a check deposited, syllabi photocopied all set to hand out a week from today when the semester begins at CU, clean house, beds changed, laundry in the dryer, a memo of detailed comments typed up to give my first children's book writing mentee when we meet tomorrow morning, and a good hour of revisions on my chapter book (the one I've been working on for the past few months, the one whose two last chapters I'm about to share with my writing group tonight). Oh, and Weight Watchers begun again - lovely steamed cauliflower for lunch, with a little bit of shredded apple and curry powder. And a long twilight walk with my friend Rowan. If I were this productive every day, I would be conquering the world. The world would already be conquered. But of course I'm not this productive every day. I wonder why I'm not, when this feels so good, this sustained, focused attention to my to-do list, making the list, crossing things off my list. Part of it is that today's heroic accomplishments were actually fairly simple, despite my crowing in the previous paragraph: making a dentist appointment isn't the kind of thing you have to force yourself to do, the kind of thing you agonize over in fear that you might screw it up. Ditto for changing the beds. Eating the cauliflower is more challenging, or at least there were many days that went by between my buying it and my eating it so I must have found it at least somewhat overwhelming. Even the book revisions: candor compels me to say that I made only the very easy changes: correcting typos, deleting sentences that my writing group didn't like. I didn't actually ADD any sentences. But still. Tomorrow I WILL add some sentences. Or at least add some words to some sentences. And meet with my mentee. And eat some more cauliflower. My prediction is that it will be another good day. So far I am VERY pleased with my resolution to cram my life filled with fun and joy. 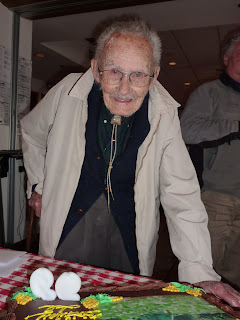 Yesterday we celebrated Grandpa's 99th birthday with a lovely party at Dino's, on Colfax in Lakewood, with 23 in attendance: family, friends, neighbors, guests of all ages - and the same wonderful waitress who has served us for every single Grandpa's birthday party for the last decade. Then we spent this afternoon at a concert at the Mercury Cafe in Denver, a gala event in honor of the tenth anniversary of the Colorado Conservatory for the Jazz Arts and also the launch party for the CD Gregory recorded with the Jazz Arts Messengers last summer at a CCJA recording camp. At the party, the group performed all original compositions by the group's members, including Gregory's hauntingly beautiful "Abril." In addition, I submitted an abstract for an essay I want to write for an edited collection commemorating the centennial of the publication of The Secret Garden, read a full-length novel manuscript for one of the people I'll be mentoring for the next six months through the Society of Children's Book Writers and Illustrators, and read one book I need to read for my Rousseau and children's literature paper. It is so motivating to have the goal of fun and joy! The book I read for the Rousseau project was Ida B by Katherine Hannigan. Ida B can't wait to hurry through her chores so she can tackle her afternoon to-do list: "I had three places I wanted to visit, six things I wanted to make, and two conversations I hoped to have before dinnertime." Her father tells her to "hold her horses," that there is plenty of time to do whatever she is planning. Not so! Ida B makes him look her straight in the eyes as she tells him, "Daddy, there is never enough time for fun." Well said, Ida B! And happy birthday, Grandpa! Oh, how I love the start of a new year! I have my little notebook all organized for 2010. I've set up the pages I'll need for my monthly list of nice things and accomplishments that I eagerly record as they occur; I've set up the pages for the list of the books I read (last year I read 101 books- though most were children's books, so some were very short - but some were very long!). Because I'm using the second half of the notebook I began last year, I can just refer back to the page that has my list of mantras. My three main ones are "If it is to be, it's up to me" and "Be intent on the perfection of the present day" and a reminder of my four pillars of happiness: reading, writing, walking, friends. And I have my main resolution for the year, which I'm so excited about: Have all the children's book fun and joy possible. Say yes to everything that has to do with children's books. Say no to everything else, or at least minimize it, or best of all, turn it in to children's books (see my post on Two Lives/One Life a couple of days ago). Then I have my subsidiary resolution: Have all the fun and joy possible of ANY kind, fun and joy, period! Don't pass up any chance for fun and joy, however they present themselves. This strategy is SO going to work! In the past sometimes I've tried to eliminate or minimize negative things from my life, but I've found that the best way to do this is instead to focus on adding more of the positive. Add so much positive that there isn't any room left for the negative, that the negative gets crowded out completely. I used to work on saying no to things I didn't want to do, but now I focus on saying yes to what I DO want to do, because then there simply won't be any time left to do those things I was trying to make myself say no to.